Although this is the cupcake portion of the schedule, it is nice to be in the middle of a basketball win streak. With their win over Dartmouth, the team has now won five in a row. The team started slow, but pulled away for a convincing statement game. Here are my thoughts on the past two games and what we need to do once ACC play begins. -- Finally making their 3s. We know Jackson can get hot. Now it looks like Heckmann and Rahon can also make multiple 3s. If we are ever going to be a quality team, they will all have to make a lot of 3-pointers. -- Good movement on offense. The team finally seems to have some actual motion in our motion offense. I don't know if Donahue is trusting them more or if they understand the offense better or if it is because of Rahon and Hanlon, but the team moved and passed with a purpose. This led to more quality shots. -- More solid minutes from Odio. He is not an ACC quality big man, but he's all we got with Van Nest and Clifford at less than 100%. But it is good to have an energy guy and his defense is improving. -- Ryan Anderson's passive play. Like the 3-point conversions, if we are going to win any ACC games, Ryan Anderson is going to have to dominate. His play wasn't poor during this stretch and his stats are good, but he needs to be better. -- Huge defensive lapses. We had them against Dartmouth and Holy Cross. That can't keep happening. A defensive lapse against Dartmouth may lead to six or eight points. Against Duke, you can be down 20 in the blink of an eye. -- No size. As much as I like what Odio is doing, he is not enough. If Clifford never gets better we will be lucky to win two ACC games. There has been a recurring debate as to why our OLine has fallen apart: is it coaching or talent? The NFL doesn't think it is a talent issue as both Emmett Cleary and John Wetzel have been invited to the NFL Combine. Neither had a great season, but both have great potential and NFL size. I hope they both do well. As we know from past BC invites, going to the Combine doesn't guarantee anything, but it is a good indicator of what NFL people are thinking. The New York Times posted a Jerry York feature. Patch Alber may be done for the season. Women's basketball lost to Florida State. The men's team beat Holy Cross. I will have a more developed post on them this Monday. The Patriots waived former Eagle Ron Brace. The BC star never clicked in New England's varied schemes. Hopefully he catches on somewhere. Jerry York is now college hockey's winningest coach. He moved into sole possession of the most wins with an uneventful win over Alabama-Huntsville. It doesn't get easier though, as BC will face Minnesota on Sunday. BC will hold a celebration to honor York January 18. In the run up to the event I will have more on York and his impact on BC. Congrats to York and all the teams that contributed to his wins. Let's hope he can soon start adding more championships to his resume. After a little post-Christmas lull, BC sports start up anew Saturday. For some it will be about another championship charge, for others it will be about setting a course back to respectability. Hockey takes on Alabama-Huntsville on Saturday as part of the Mariucci Classic. Hunstville is terrible and shouldn't pose much of a threat. Sunday is a different story. BC takes on Minnesota. The Gophers are the No. 4 ranked team in the country and should serve as a good barometer. The game is televised (check your local sport channels). Basketball faces Holy Cross. BC has won three in a row and desperately needs to keep that momentum going. BC only has a few more chances to pad the win total before ACC play. Football remains in a dead period for recruiting, but that doesn't mean Addazio is not at work. The staff cannot travel, but they can still host recruits and have limited phone contact. As the lower level bowls wrap up, I expect Addazio to finalize his staff. A slew of coaches will now be looking for new jobs, and some NFL staffs will get fired on Monday. There are plenty of good guys out there. Bruce Feldman's tweet about Florida Offensive Lineman Matt Patchan being interested in BC got me thinking. Why stop with just guys Addazio has a relationship with? Addazio and his staff should be making a grand push to get any interested and eligible fifth year to come to BC next season. It is a stop gap measure that could pay a nice dividend in Year 1. The current recruiting class is not well regarded. The new staff is doing its best to fill the holes, keep the committed guys interested and find a few diamonds in the rough. It is what any transition staff does. But most freshman are not going to come in and have an immediate impact. An older, more mature and developed player might. Since BC rarely takes Junior College players, the only way to get older players in the program is by exploiting the NCAA's graduated player transfer policy. This allows a player with eligibility and his degree to transfer without restriction to another program (there are a few academic stipulations attached too). It is the policy Montel Harris used to play at Temple without sitting a season. If BC adds a few 5th years this year, this recruiting class might get a boost and we might get enough talent to win six games and go bowling again. There is really no downside to the 5th year path. They have their degrees so BC's academic concerns and focus on graduation rate is not an issue. Addazio doesn't lock up a scholarship for four years on a player who might not perform. Taking a fifth year doesn't prevent him from filling out a huge class in the 2014 recruiting cycle. A few players might be put off by a "new guy" coming in above them, but in those cases winning wins out and competition can help change the culture. If you don't want a 5th year coming in and taking your playing time, then play better and practice harder. None of the 5th years are without baggage. If they were perfect they wouldn't be available. But for a program like BC, it is all about the short-term upside. If a guy can help make the transition smooth and not interrupt the rebuilding process, there is no reason not to take him. Addazio saw what Montel Harris could do. Let's hope he brings that lesson to BC. The NFL announced its Pro Bowl rosters and Matt Ryan was the lone BC guy to get the invite to Hawaii. While I tweet on the topic, I rarely mention the media narrative building around Ryan. Even here in Atlanta -- where you figure the fanbase would all be defenders -- there are still plenty of Matt Ryan critics. The Pro Bowl is a nice honor, but no one aside from some true believers (like most BC fans) will put Matt in the "great" category until he wins something in the postseason. UPDATE: Chris Snee was also named to the Pro Bowl. Nick Clancy signed with an agent and is projected to be a late round pick. In case you missed it, ESPN's ACC crew predict we won't be bowling in 2013. I am not ready to make a prediction one way or the other yet, but our schedule is now pretty favorable. A rising Massachusetts baseball star committed to BC. He won't graduate from high school until 2015. Olivier Hanlan was named Co-ACC Rookie of the Week. Bruce Feldman likes the staff we are building. Merry Christmas to all. Thank you for your support. Let's hope Santa brings us another National Championship in Hockey and some better results in football and basketball this year. Regular blogging will resume December 26th. For now, please enjoy your family and friends. In case you missed it, the Globe featured Steve Addazio this weekend. The Temple angle was interesting and shows how loyalty and dedication is all about perspective. I don't hold it against Addazio for leaving on Temple after two years. 99.99% of coaches would have done the same. Four players from the Women's Ice Hockey team received invitations to the U. S. National Team Winter Camp. Penn State is still coming after BC recruit Myles Willis. He says he's still committed to BC. I don't know if the basketball team has turned a corner. But Saturday's win over Providence was very encouraging. They made some shots, executed in the final minutes and got good games from all the critical players. Here are my thoughts. As always, leave yours below. -- Ball movement. The team played well and it started with smart, purposeful passing. I really liked some of the decisions Rohan and Jackson made. -- Anderson finishing near the basket. Great mix of strength and touch. He converted a huge basket late. -- Solid minutes from Odio and Caudill. With Van Nest hurt and Clifford far from 100% we need these two guys to provide some energy and solid defense. They did. -- ESPN3's feed. I've been a big proponent of ESPN's online service, but today was not good. There were multiple stretches in the second half when the stream died. If they want fans to accept it as an alternative, they need to make sure the performance and quality are good. -- Guard depth. The freshmen were good, but I don't love the idea of them playing all 40 minutes. This is one of those stretches where we could use Jordan Daniels. Another day, another round of staff announcements. Rumored candidate and friend of Addazio -- Frank Piriano -- will be Tight Ends coach. Leonard has a decent resume with a mix of college and NFL stops. He was with Temple last year. The more critical hire is a different Temple guy. Addazio is bringing his strength and conditioning coach Frank Piraino over to BC. The S&C guy now serves as an important bridge between monitored sessions and the offseason workouts. Piriano came up in the Florida program, so you can assume he follows the Urban Meyer school of thought -- with a focus more on speed than size. It is probably closer to what we did under Jags vs the TOB/Spaz philosophy. Still no announcement regarding other holdovers. To me that indicates it is unlikely that other Spaz guys will stay on with Addazio. The two most often rumored staff members became official when BC announced that Addazio hired Justin Frye as Offensive Line coach and former Defensive Coordinator Bill McGovern will transition back to Linebackers coach. Frye is a bit green to get such a critical position for BC, but I think he will benefit from working under Addazio (himself a former OL coach). As one of the younger members of the staff, you have to assume that Fyre will be a key recruiter. Bill McGovern staying on is more complicated. Addazio will be the fifth BC coach McGovern has worked under and that should carry some weight. McGovern is beloved by former players and many went to bat for him this go around. He's obviously well liked and is now a BC parent, so I respect his relationships and ties to the school. It is important to have people like that around the program. However, McGovern is the embodiment of many of the issues of the last ten years. We need new ones and going 2-10 confirms that. Once a valuable recruiter, McGovern has been sidelined a bit as Spaz's DC. Is he ready to hit the road again and become our man in New Jersey? Can he work with Don Brown after serving as DC last year? How will he adjust to the demotion? These are all big factors. I am happy for McGovern that his professional life didn't disrupt his personnel life too much. He doesn't have to uproot. But I hope he buys in to his new role. It will be critical for Addazio's success. There will be much to study about Don Brown over the next few months, but I thought a good place to start would be in his games against BC. The Eagles have faced his defenses four times, winning three games. But the win-loss record doesn't capture Brown's side of the ball and the chaos he caused. We won this game 29-7, but Brown gave Paul Peterson fits. Peterson threw three picks and only completed 16 of 30 passes. As expected, Brown blitzed often and forced Peterson into some rushed throws. The game was close and BC only really pulled away when our defense started making plays. BC also went heavy on the run in the second half. BC was flying high coming into this game and the fans got a real wakeup call. After going up early BC stalled out and UMass cut the lead to three points. Matt then put the game away with an efficient drive. The problem was between the strong opening and the strong close, UMass knocked Ryan around. The game recap recounts: "Ryan was sacked once, roughed once illegally, forced to scramble three times and knocked down on a half-dozen or more other plays." UMass held him to 204 passing yards, with 24 completions on 42 attempts. This was a low-scoring game that BC won despite Maryland having multiple chances to comeback. We also got to see the risk of Brown's blitzes. BC scored on a 66-yard touchdown when Shinskie hit Larmond in stride on the blitz. Once Larmond beat his man, no one could come over to help. Another recurring theme of BC taking on Brown's D was our ability to run the ball. Montel Harris had 142 yards. This was a weird game in that Maryland got up early, BC calmed down and Rettig tried to lead a comeback. What I remember and appreciate is that even as BC climbed back, Brown didn't go into prevent. They kept coming. They also picked off Rettig twice. Longtime BC staffer Barry Gallup lost his daughter to cancer. Keep them in your prayers. Get your New Mexico State tickets! They're going fast! Blauds broke the news that BC filled its open schedule slot with New Mexico State. The home game will be played in November and BC's home schedule now includes Army, Stony Brook and New Mexico State. That lineup is not going to help ticket sales. While I wanted BC to find a power program for the open spot or consider a road game payday, I can live with New Mexico State. If we have an outside chance at a bowl game, we need another W from somewhere. NMSU shouldn't be very good and by November we should have all of our transition issues resolved. You can't really spin any other benefits. There is no recruiting advantage nor media interest. But the ACC screwed up our schedule and Bates made the best of it. Bruce Feldman is reporting that Don Brown will be the new Defensive Coordinator. This is a strong hire on many fronts. Brown knows New England inside and out having worked at both UMass and UConn. He was also a successful head coach at UMass, winning nearly 70% of his games. Addazio only has two years of head coaching experience. Having a seasoned coordinator who has been a head coach should be a stabilizing force and provide a good sounding board. Brown also has experience coaching in the ACC, as he was the DC for Friedgen's final two seasons. This is a clear change in our approach. If Spaz was a bend but don't break, Brown is the opposite. He blitzes early and often. It might not provide the consistency of the good Spaz's defenses, but the approach will be aggressive and hopefully fun to watch. Ironically Mark Whipple insisting on Brown over Spaz as his DC was one of the reasons Whipple didn't get the job in 2007. Now things have come full circle. I don't know if we have the players to carry out Brown's designs in 2013, but at least this is a signal that Addazio is going to pave his own way and change the approach on the field. Wide Receivers coach Aaron Smith will not be retained by Addazio. We know that via a recruit's twitter. Blauds hints that McGovern may return but not as DC. BC has removed all links to the coaches bios from the roster page. I will wait to comment on McGovern or any other holdover once the staff is officially in place. I will stand by my belief that Addazio needs to clean house. I know Addazio has complete autonomy but there is always going to be pressure (real or implied) to keep certain guys. At BC that means Gallup, McGovern and Washington. Crystal Ball Run was one national college football blog that killed Spaz every chance they got. They are cautiously optimistic about Addazio. Another metric and another indicator of how bad BC's offense was under Spaz. In case you missed it, here is the Globe's feature on Bates. "We talked about the offense quite a bit," said Lowrie. "We talked about what he's looking for in a quarterback and how he wants a guy that can move around in the pocket, do some QB-read stuff." That doesn't come out and say we need dual-threat QBs, but the read and mobility talk do indicate more of a run-based offense. I just hope we are not rigid in the first few seasons. You can adapt an offense season to season yet still keep the same core plays and philosophy. What we need is some efficiency, scoring and excitement. -- Huge game from Ryan Anderson. It looks like his gimpy ankle is healed. He moved well today and put up huge numbers. He also made some good defensive plays. -- Heckmann's athleticism. He had a few nice defensive plays late and did this. -- Rahon handling it late. Donahue said he has the best feel for what they are trying to do. At least someone does. -- Shooting. You can talk about talent issues or understanding the system, but the shooting is inexplicable. These guys used to shoot and now they can't buy a basket. We also supposedly have great shooting instructors on staff. Someone needs to figure out what is going on! -- Defensive lapses. How is this still happening. They tightened up down the stretch but left themselves in a huge hole because no one on this team plays consistent defense. One of BC's highest rated recruits, Ohio Running Back LeShun Daniels decommitted and is now headed to Iowa. This one hurts. Running back is a position of need and emphasis for Addazio. Daniels had the chance to come in right away and contribute. Seeing players waiver is natural though and only more predictable when there is a coaching change. Fortunately Addazio is out trying to find another back. One other thing that is more apparent is that BC is probably taking three QBs in this class. BC just offered a scholarship to South Carolina Dual Threat QB Michael Julian. We need QB talent but not three in one class. I know BC is honoring all of Spaz's commitments, but I expect something to give with the two QBs who verbaled to Spaz. It is clear Addazio is headed in a different direction. I just hope BC manages the roster and expectations well in this process. As his tackles pile up, many NFL pundits are realizing that Luke Kuechly should win the NFL's Defensive Rookie of the Year award. Carolina is out of the spotlight, but if Luke keeps up this pace, he will lead the league in tackles. The Football team handed out their awards the other night. Emmett Cleary won the Scanlan Award and Amidon was named MVP. Congratulations to them and let's hope our next football banquet comes next January after a bowl win. Here is more on Jags where his friend and new boss specifically deal with his departure from BC. BC offered a scholarship to Florida Safety Darrion Owens. Big East basketball schools say "bye bye"
The Big East basketball only Catholic schools have had enough. They are now set to break away from the conference they founded and are fighting to take the Big East's history and assets with them. I think it makes sense and is long overdue. What they've learned is that if you expand too quickly and without much thought you undermine what you are and who you associate with. Georgetown doesn't want to play Tulane. UCF isn't going to bring in the fans at Providence. A tighter, aligned group of Catholic schools should thrive based purely on increased revenue and the chance to recruit and sell an actual identity and not some membership of an every changing group of disparate schools. The BC and the ACC could learn a thing or two from the Catholic schools' move. For the ACC the lesson is obvious: make sure all expansions keeps the schools aligned and the schools share the same values. The ACC is moving further and further away from that and it may be our undoing. But I think there are enough like-minded schools to hold the core together. For BC, it is more of a reminder. We have real football when our other Catholic brothers do not. Our commitment to playing "big time" sports has paid off tenfold. We could have put sports on the backburner multiple times through the decades. Even joining the Big East was a risk at first. And every time we've taken a risk, we've raised the profile of the school. I don't know how the next decade will play out, but I hope BC realizes that aggressive leadership has served us well. Without it we might be Holy Cross or UConn right now. BC needs a 12th game for next season. At this point it looks like we are going to "buy" a game with a low level FBS or even FCS team. While this would likely pad our 2013 win total, it won't do much for the bottom line nor give fan interest a boost. BCI has often suggested moving up the UMass series to fill the void. Given UMass's huge attendance issues at Gillette, I have a new suggestion: we should play the Minutemen in Foxborough! BC benefits from a game in Foxborough on a few different fronts. The biggest reason to play the game is that it allows BC to test the off-campus game without much risk. We don't sacrifice one of our true home games yet all of our fans could attend the game. We could finally see how much demand there is for a true tailgating experience. BC would also pad our win total without having to pay for the cupcake to come to Alumni. Even with the low travel cost, a game against UMass in Foxoborough wouldn't be as profitable as a home game, but depending on who we pay to play, it could be fairly close. Although I doubt we will be a factor in the BCS rankings, playing a game on the road gives a better strength of schedule rating than playing a cupcake at home. I don't know where Bates and Addazio are with regards to our open slot. I don't expect anything risky. The nice thing about a potential UMass road game is that it is a financial and marketing risk, not a football one. Stokes Hall -- BC's latest construction project -- is nearing its opening and receiving a lot of media attention. The project represents the University's commitment to the humanities, but I also think it could serve as a template for BC Athletics...and not just because it sits on the original home of Alumni Stadium. BC has numerous Athletic construction project needs. Just at a high level, BC needs to renovate the Plex, finally build the baseball/softball complex, commit to heavy renovation or total rebuild of the Conte/Alumni complex and build an indoor practice facility (the practice facility might be shoehorned into the Plex or Alumni remodel). All might seem daunting to Brad Bates, but if he looks to Stokes, he will hopefully realize it can be done. No one wanted to see the Dust Bowl go away, but BC needed the space. There are pockets around campus that could also support some of Athletic's needs. Bates and the planning team just need to be creative and also appease those who fear the loss of more green space or don't want a congested campus. BC raised $78 million for the building, including a named donation for $22 million. If planned right and if they approach the right donors, Bates could easily raise more than $100 million. Now $100 million won't cover all the projects on the "To Do" list but it could cover the Plex and Indoor Practice Facility. The cost of the Alumni/Conte renovations really depend on how far BC is willing to go. Although it is nestled along what's left of the Dust Bowl, Stokes was a big undertaking and a big building. BC could have halved the square footage and still had a significant project. I hope BC thinks big on the sports needs too. I've referenced a Conte/Alumni renovation, but what about a full demolition and rebuild on the same footprint? That way we could build something that met our needs for football, basketball, hockey, hockey practice, basketball practice, football practice and meeting space. It would probably cost $400 million+, take three years and involve our teams using the Garden or Fenway for a few seasons, but long-term it would be worth it. The people who pushed Stokes thought that way. The people in charge of Athletics need to do the same. Beyond Ryan Day there is still no official word on who will be part of Addazio's BC staff. I reached out to BC for some sort of confirmation on the various rumors and was told everything is still TBD. If you're a frustrated BC fan and cannot understand why Notre Dame received a partial membership in the ACC, just look at this TV ratings chart. The resurgent Irish proved to be a solid TV draw throughout the season. If you look further into this listing you'll see that even in a very down year, BC held its own on the TV front. If you want to get a feel for how College Presidents and ADs scramble during this conference shuffling, read what Cincinnati did in an attempt to join the ACC. Local Atlanta FBS newbie Georgia State hired Jags as their OC. Jags has been through a lot professionally since he left. I hope he succeeds this time around. Hockey East name Michael Matheson Co-Rockey of the Week. Several Eagles are trying out for the MLS. What should we expect next season? In talking to various people the past week, I was surprised that two different BC employees shared their optimism for 2013. They think we will win next year and that the ability to win right away factored into the Addazio decision. 2-10 is the best indicator that BC was a bad team. Even if you think Spaz underachieved (like I do), that terrible record means that even with great coaching, this team didn't have the talent to win the ACC. Next year the majority of that team returns. They will be more experienced and presumably better coached, but can we expect much improvement? 4-8 would be doubling our win total. Getting to six wins and a bowl would be worthy of ACC Coach of the year consideration. who will fill our open date? what sort of offense will he run with Rettig? what recruits will we land? will any of this year's injured players make a healthy return? Assuming we schedule a cupcake to fill our open slot, four wins should be achievable. In my opinion six wins really depends on the strength of the ACC next season. What do you expect from our new coach next season? Addazio is not wasting any time trying to solidify this transitional recruiting class. The first stumble was losing top-ranked kicker Michael Geiger to Michigan State. While disappointing, I don't think it should cause anyone to panic. We have time to find another kicker or could wait until next recruiting season. Meanwhile Addazio and Day have been visiting all the other commitments to reaffirm their relationship with BC. They seem to be well received. What's interesting is that Atam Ntantang tweeted that he is expecting a visit from Mike Siravo on Tuesday. Is that the first hint that Siravo might be staying in some capacity? Even with the good first impressions, I expect other Spaz commitments will stray. It is only natural. Outside of locking down the guys who committed to Spaz, Addazio is also trying to flip some kids to BC. Rumored targets included Florida Running Back Robert Davis and Asiantii Woulard. Woulard would be a big indicator of BC's future direction. We already have two QBs committed. A third would show that Addazio wants to transition to dual threat QBs sooner rather than later. "This is a moment that I've dreamed about since I've been a kid running around the backyard pretending I was Doug Flutie throwing Hail Marys to my dad." 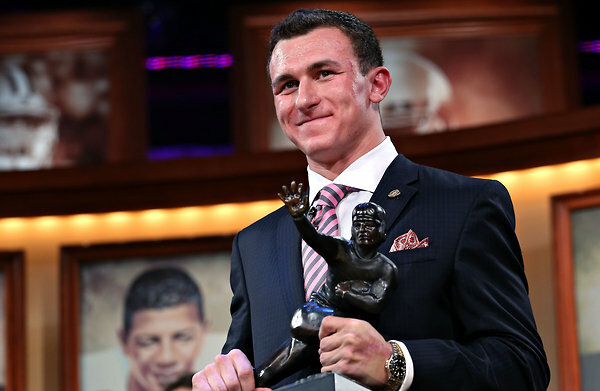 Johnny Manziel was born in 1992. Yet the Texan knew enough to pretend to be Doug Flutie. Regardless of who coaches BC, we need to keep selling the Flutie Hail Mary to potential QBs because this is proof that even 28 years later, they are already dreaming about it. The basketball team beat St. Francis today and it served as a reminder that they've had a rough couple weeks. Fortunately for Steve Donahue, most BC fans have been paying attention to the football coaching change. And many of those who have been paying attention have written off this basketball season. I haven't reached that point yet, but I have serious concerns about how things are progressing. Even with the win today, some of the same issues kept popping up. This team is still prone to long defensive lapses. They also have possessions when guys seem to be going through the motions. Heckmann is getting better but still has moments where he makes multiple mistakes. Our frontline is not ACC caliber when Anderson and Clifford miss time due to injuries. The good news is that the St. Francis game could have been another collapse, but the guys rallied. The freshman made some big plays and Lonnie Jackson made a few "3's." They also started playing defense. After the Harvard loss (that no one wanted to talk about) Steve Donahue said experience wasn't an excuse any more. He also put the team through a tough practice. Maybe they will start to improve. I don't want to read too much into Saturday's game. St. Francis is not very good. But the next few non-conference games should serve as a good barometer of what we can expect during ACC play. Didn't someone tell Providence they were supposed to let us win tonight? Instead BC tied the Friars leaving Jerry York tied with Ron Mason for the most all-time wins in College Hockey. York won't have a chance to own the record until the team resumes play after Christmas. 1. Go to www.asgardpress.com, and use the promo code "atleagle12." 2. Just click on the link below. This offer is good now until February 1, 2013. None of us knows if this will work, so I just have to trust my instincts. After contemplating my initial surprise and disappointment, I thought Addazio would be fine at BC. He's not a gamechanger. He's a bit of a goof. But his core traits -- energy and recruiting -- would get us back to a respectable level of BCS football. Even Florida fans who mocked his offense will candidly tell you about his ability to recruit. I know recruiting at BC will be different, but you could see from his press conference that he's probably good in a living room or coaching clinic. If Addazio gets the best kids from New England, sprinkles in some three stars from New Jersey and Ohio and fills out the class with typical BC under the radar types we will have enough talent to compete every year. Recruiting takes effort. To be great at it, you have to love it. Addazio does and I expect that passion to carry over into the assistants. Spaz was a terrible recruiter. He didn't sell and didn't try and his apathy carried over to the assistants. In my opinion any successful venture begins with a shared belief in the goals and what could be accomplished. I don't know if Addazio can win championships at BC, but he certainly believes he can. I am sure the "Little Engine That Could" shtick will wear on us eventually, but it is refreshing. I would say that two of our last three head coaches only believed that you could win eight games at BC and only mentioned championships to appease the fans. I've written this before, but our football world is very small. We only need to be better than six teams ( Louisville, NC State, Clemson, Wake Forest, Florida State, and Syracuse). Syracuse and Wake Forest don't concern me. I like Dave Doeren but think he will have a tough adjustment in Raliegh. I think Louisville is well coached and I think Clemson and Florida State are both coached by guys just like Addazio (high energy recruiters with questionable Xs and Os). We can compete against all of those programs. I also think we benefit from Penn State having limited scholarships and UConn being stranded in the Big East. Our recruiting should get easier on those factors alone. As long as he does what he is supposed to do -- recruit -- and empowers solid coordinators, Addizio can reach a consistent level of success. As a reminder Bicknell, Henning, TOB, Jags and Spaz all won bowl games at BC. It doesn't take a coaching genius. We may not be headed to the elite of college football, but we are headed back in the right direction. In his off-campus Pow Wow before Thanksgiving with select "friends of BC," the group told Brad Bates that three names would be deflating hires to the BC fanbase. Those names were Tim Murphy, Sean McDonnell and Steve Addazio. The three-tier plan discussed at that meeting was executed but now it looks like Bates wanted Addazio all along. This wasn't a case of BC getting spurned at the altar. BC didn't get into money issues with the realistic candidates. We offered the job to Steve Addazio and no one else. I am part of the half-full group on Addazio and like many of his attributes. But I think Brad Bates risked too much equity on this hire. This was Bates' first major decision at BC. He better hope Addazio overdelivers, because Bates used up a lot of goodwill with the move. Let me explain why. When BC hired TOB, no one knew him. It was another circus search where people turned us down, multiple candidates thought they were getting the job and then out of nowhere we named the Virginia Offensive Coordinator our new head coach. TOB was himself from Day 1, so fans weren't ready to run through brick walls for him, but we bought into the "plan." TOB was going to rebuild BC the right way. And when there were stumbles in the first two years, TOB still had our support because we had no preconceived reason to doubt he would turn the corner. If TOB had come to BC off of a losing season at another program and hired a bunch of Henning assistants, that unanimous support would not have lasted very long. You can raise money and sell tickets around a blank slate. Addazio has a fire to rally around, but brings enough skepticism that some will withhold financial and emotional support until he wins. Blank slates also have bigger upside. You never know when the next coordinator turns into the next championship coach. Addizio is so much better than Spaz, but I don't think many see him winning championships. Perception is that if he was of that caliber Florida wouldn't have passed over him and he would have had a better first year in the Big East with Temple. I am President of the Ryan Day Fan Club. I think Kevin Rogers deserves a Nobel Prize for pointing out Spaz's idiocy. I think Day will be a great OC. But when we struggle next year and possibly longer, there will be questions as to why we went in this direction. Smart fans know what they saw here and can read the terrible stats that Temple produced this year. If we had hired someone completely removed from the Spaz drama and with a more productive offense, people would be more excited about this change. Plus people know about Addazio's true desire for this job. He desperately wanted it four years ago. So now when he is finally hired and slightly less attractive due to how things played out at Temple, he has the feel of a retread or a guy that Gene Defilippo might have called. Watch this video of Bates Tuesday night courtesy of Conrad Kaczmarek. You can tell he was genuinely surprised by how much Addazio knew about BC. (Other candidates were supposedly ill prepared.) As we saw at the press conference, Addazio is a salesman, but should he get special credit for knowing BC inside and out? Because of his relationship with Day and Rogers, he knew the roster and the program's recent challenges. He probably knows more than Bates. If he wanted, I am sure Addazio could have called up John Defilippo and got a rundown of some of BC's biggest donors. Addazio still had to deliver in the interview, but he shouldn't get credit for acing a test for which he had been given all the answers. If the interview was the deciding factor, I hope Addazio's access to the program was at least recognized. I don't know how political things were at Miami of Ohio, but Brad Bates is a Michigan Football Alumni. He knows how his fellow Wolverines made Rich Rodriquez's life hell because he wasn't a "Michigan Man." BC is not that sort of culture, but you do have to do things the right way. Bates had more of a process than Gene ever had and did reach out to many people. Yet there were plenty of coaches and agents who reached out to BC and didn't get any acknowledgement back. There were also some key BC and BC-friendly folks who wanted the job and weren't handled very well. And when you take the time to gather a small group of heavy hitters and then ignore their warnings, you start things off on the wrong foot. I am ready for some fun and passion. I predict good things for Addazio. I think he will achieve a TOB-level of success. However, my worries about Brad Bates have bubbled up. We will have to replace Jerry York one day and might have a basketball search on our hands sooner rather than later. Is Bates going to take the same approach in those searches? Let's hope Addazio unites the fanbase through victory, because this process didn't. I liked the press conference. In general they are hard to screw up, but Addizio clearly has passion. I think he will be fine and will explain later tonight. I will also share my thoughts on Brad Bates' first major search and decision. Long-time readers and my critics can hopefully chuckle at this post's headline. I don't think think anyone expected the twists and turns it took to get the job. His results in Temple were not good and there are many BC fans that think he is all hype, but I like the move. My hope is that Addazio will give him free reign and we will finally have a consistent and competent offense. Day got screwed by Gene and Spaz. He could be coaching in many other places, but he wants to be at BC. Obviously as Bates has just explained, that desire to win at BC means a lot to the administration. I will obviously have more opinion as this all develops. 1. Be sure to acknowledge Jerry York's awesomeness. 2. Talk about how important it is to graduate players. 3. Say that BC is your dream job and the only one you ever would have left "_______" for. 4. Talk about your passion and how you can't wait to start. The Steve Addazio hire left me lukewarm, but because I see some positives in the move, I am being put in the Pollyanna category. I wish BC had gone in another direction, but that is a Brad Bates issue. For now, I want Steve Addazio to succeed and believe he can. To help him succeed, I am posting some straight forward advice. 1. Do not retain Bill McGovern, Mike Siravo, Jeff Commissiong or Sean Devine. I don't write this lightly. Families are impacted by these moves. I know all four have served BC well for many years. I am sure Ryan Day and Kevin Rogers will provide endorsements of all four. But if you want to succeed and truly rebuild you need new ideas and new blood. These four staffers are too closely associated with BC's decline under Spaz. High school coaches, recruits and fans need to think BC is turning the corner. It is hard to do that with the same faces on the sidelines. If Ryan Day is coming back to BC, I don't know if you need to retain any coach to provide a bridge between staffs. 2. Recruit like there is no tomorrow. One of the things I like about Addazio is that he is supposedly handsoff with his coordinators. That is good and leaves him more time to do what he is known for: recruiting. Not only does Addazio need to hold this class together, he needs to pick up a few guys from other programs. With the shakeup at Wisconsin and the staff changes at UVA, there should be some good kids to poach. I also want him loading up for next year. Spaz didn't leave Addazio with a ton of talent, but he left him with plenty of scholarships. BC should take 25 kids in 2014 and 25 in 2015. Recruiting for that class starts now. 3. Hire the best Offensive Line Coach in the country. I don't know anything about Justin Frye (Addazio's current Oline coach). He could be a fantastic coach and teacher. What I do know is that Oline U is a shell of its former self. Addazio being a former OL coach will understand and also appreciate that a good line can cover a lot of our problems. Tons of good OL coaches would consider BC simply because of our reputation Go find the best. It is now official. Boston College named Steve Addazio its new head coach. The name should be somewhat familiar since it was floated when we hired Spaz. Since that time he got his shot at being a Head Coach at Temple. He is 13-11 in Philadelphia. As I posted previously, my gut reaction is that Addizio will be a fine coach. I don't think he has huge upside, but he will do enough things well to help BC reach a consistent level of success. Pros: Hardworking and respected recruiter. Florida was often able to poach the best players from New England and New Jersey. That was often because of Addazio. He has worked at schools that require athletes to attend class and graduate (Syracuse and Notre Dame). He already has a staff that is very familiar with BC's roster (Ryan Day and Kevin Rogers). This might mean that Chase Rettig gets one of his old offenses back. He's an Oline coach and will hopefully emphasize our OL tradition. If any coach is going to win, he will need to build great lines. Cons: He's 13-11 with Al Golden's players and trending the wrong way. Florida fans thought he was a terrible offensive line coach and terrible offensive coordinator. He's got Day and Rogers on staff and took Montel Harris on as a transfer. I would have preferred someone with less association to all the drama that went down with Spaz. Bottom Line: This was an opportunity to do something special. We went safe. Bates ignored or brushed off some candidates with great upsides or close ties to BC. You can rationalize that if you have a home run hire. Steve Addazio is not a home run hire. I think we are on our road back. Addazio is well-respected and a hard worker. I wish him the best and will root like hell for him to succeed. Ever to excel! SI's Pete Thamel is reporting Temple Coach Steve Addazio has been hired as BC's next coach. I didn't see that one coming. Did anyone? I will hold my longer post until later and official word comes from BC. Gut reaction is he's a decent, safe hire. I don't see him taking us to the next level, but I think he can reach TOB's level of success. As the Heights reported, an announcement on the new coach should come within 48 hours if not earlier. Multiple people are reporting that the finalists are Notre Dame Defensive Coordinator Bob Diaco, Ball State Head Coach Pete Lembo and New Orleans Offensive Line Coach Aaron Kromer. Based on all the gossip, Diaco would have to be viewed as the front-runner. I would be happy with Diaco. I would like the Lembo hire and defend it thoroughly. I am not onboard with Kromer. For now, I am hoping for a positive conclusion and a new start for BC football. UPDATE: Two minutes after I posted this, NECN said Lembo is not a finalist. Stay tuned. Based on who BC has eliminated, it is looking more and more like Diaco or some left field candidate. -- Tennessee is no longer considering Al Golden. (I got this info after my post last night.) His options now are BC, stay at Miami or try to get in the mix of another opening (Cal?). Miami folks I talked to think he is staying. Their reasoning isn't particularly emotional. They pointed out that he has a 20 starters returning and can win a bad Coastal Division next year. Even with another bowl ban coming and reduced scholarships, a successful 2013 season makes him that much more marketable. -- Last week before the "Finalists" were culled, Board of Trustees members were given bios and summaries of at least eight potential candidates. All the coaches profiled had expressed some level of interest in the job. The briefs were reviewed and a few candidates were eliminated without getting an official interview. -- Dan Mullen is not a "Finalist." Despite backchannel discussion, the two sides weren't even in the same ballpark salary-wise. In fact, Mullen has priced himself out of most jobs like Colorado, Purdue and Cal. If he doesn't get Tennessee, he will just go back to being a highly-paid sparring partner for Alabama and LSU. -- While Golden and Diaco are the confirmed members of the final three, no one seems to know the third. Highly respected message board poster BC West posted that Mike Sullivan had not been contacted as of Sunday. -- Pete Carmichael Jr is not a finalist. Dealing with Alumni is always a tricky proposition, but I am disappointed that Carmichael didn't get more traction in the process. Despite his lack of college experience, I think his role in New Orleans was significant enough to get a long look. If he didn't have a BC degree, would he be considered before other NFL guys like Greg Roman or Mike Sullivan? Probably not. But he is a BC guy and son of a long-time BC staffer. It should be factored and viewed as a positive. Al Golden should've been BC's coach years ago. But our timing and his was always a little off. Despite this most recent flirtation, I am afraid the timing is wrong again. When TOB left, Golden was untouchable. He had only been the head coach at Temple for one season and finished 1-11. If he hadn't risked everything to rebuild Temple and stayed at UVA as Defensive Coordinator, he would have gotten the BC job. He had a good relationship with Gene. He knew enough of the BC staff and culture to make the transition. Heck, even with the stinker of a season, he was more of a serious candidate than anyone realized at the time. But it wasn't meant to be. In 2009, he could have had the job again. He knew what went down between Gene and Jags, yet was still willing to roll the dice with Gene just for the chance to coach at BC and take over a BCS program. But Gene went with Spaz for reasons that had nothing to do with Golden. When he got to Miami I thought the Golden-BC shipp had finally sailed. But then the Shapiro scandal blew up and Golden's name started floating again. Was this finally the time? Some coaches shoot from the hip. Golden is a planner. I don't know if he ever saw himself at Miami, but he certainly planned on being at an elite program at this stage in his career. If Miami wasn't falling apart with the NCAA hammer hovering, he wouldn't entertain a BC offer. But our problem is that we are not the only option for Golden now. He is a real candidate for Tennessee. But the Vols are not on the same timeline we are. This is where the conflict comes into play. BC narrowed its field already and is moving to the final stages. Golden will have to make a decision on his status with BC without knowing his chances at Tennessee. He also can stay at Miami and hope to salvage one more season before sanctions make winning an impossibility. This won't be about the money. It will be about which opportunity Al Golden feels is the best for his long-term career. I don't think Golden is coming to BC. As much as he is a planner and strategist, he's also a confident coach. I think the chance of Tennessee is enough to keep him from saying yes to BC when we finally make an offer. -- Formal interviews started Friday. Bates hinted as much on Twitter. As I posted yesterday Dave Doeren was never even called. I have no other confirmation on who was or wasn't called. I do know that earlier in the week BC did reach out to the "A" list of O'Brien, Golden and Mullen. O'Brien is not leaving Penn State. Mullen and Golden are still in the mix for multiple jobs. -- BC told one coach's agent that they have their three finalists. This was an agent trying to get a client in the mix and was rebuffed. I don't know who the three are. -- Bates isn't on a hard timeline but wants a coach in place and on campus for a press conference and team meeting before exams. Exams start December 13. -- Finalists will get a meeting with Leahy this week. A deal will be done later in the week. I am encouraged that current BC assistants are still working on the recruiting class. Through their work, BC picked up a commitment from Massachusetts defensive tackle Tevin Montgomery. Coach Aaron Smith is visiting committed players to keep them locked into the class. None of these guys should be forced on the new coach, but I hope Bates does his best to help them find new jobs in football. It was much easier to handicap the field when Gene was around. He was predictable and there were plenty of people around BC who liked to talk. Bates changes all of that for most observers and reporters. But I am impressed with his thoroughness, commitment to a process and not getting distracted by what others are doing. Process is good, but it doesn't help those who want answers. I am more confident in which guys it won't be. But as of right now (just after midnight) I would guess it is either Lembo, Sullivan or Diaco. But who knows? As always I will share what I know when I know it. Stay tuned. We know that Jerry York is the best. Now his record reaffirms it. With the win over BU Saturday night York tied Ron Mason as College Hockey's all-time wins leader. The game itself was a nice rebound from Friday's loss to BU. BC broke away with two goals less than a minute apart late in the Second. York will own the record shortly. His first shot comes next week against Providence. 3. Dave Doeren, Northern Illinois. I think Doeren would be ideal. He has an intensity and work ethic that we've been lacking since Coughlin. I think he could come to BC, do big things and restore our talent base quickly. His record at Northern Illinois has been very impressive. But I don't think he'll end up at at the Heights. His name is being mentioned for multiple jobs and I don't see BC chasing after the "hot" name. I've been wrong before, but if Doeren ends up at Purdue, I think it will be a missed opportunity for both sides. Doeren is my ideal. I ranked him third because I don't think he is BC's top choice (for a variety of reasons) and I don't think we are his top choice (for a variety of reasons). I think it is a shame, but I don't think it comes together. When both sides start off with doubts, I don't think the relationship comes together...especially when both have options. Doeren is an aggressive guy and made it clear publicly he was leaving Northern Illinois. I don't think BC liked that approach. I don't think Bates needs a candidate who is willing to sign a lifetime contract in blood, but I do think they want someone who is excited to be at BC and who is going to carry himself in a certain way. Bates is starting his process with his top targets. Doeren may have been called eventually, but when NC State made an offer, he was the type that was going to take it. But BC is operating from a position of strength. There are plenty of good candidates out there. Bates will find the right guy for BC. Even though I really liked Doeren I am not worried about him being in our division. I think NC State has some issues that will prevent him from being anything more than TOB or Amato were there. I also don't think working for Debbie Yow is going to be a picnic.